According to witnesses, violent right-wing opposition members torched the trucks on the Colombian side with Molotov cocktails trying to incriminate Venezuelan security forces. Feb 23 (teleSUR) A new episode in the false flag operation being waged against the Venezuelan government to justify a foreign intervention, happened on the Francisco de Paula Santander International Bridge that links Venezuela and Colombia. 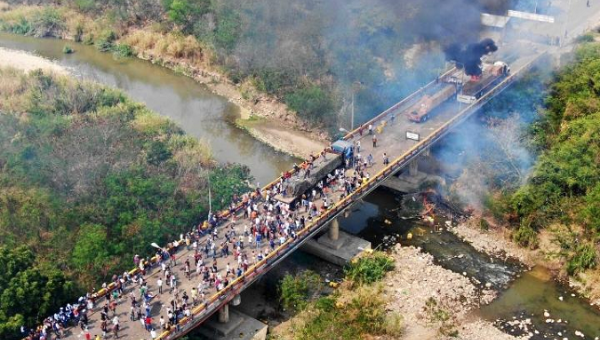 Two out of the four trucks with alleged “humanitarian aid” from USAID, which were trying to illegally enter Venezuela, were burned at the border between the two countries. The burning trucks were on the Colombian side of the Francisco de Paula Santander Bridge where Venezuelan opposition leaders have been leading protests. The version if events saying that the trucks burned due to a “teargas bomb”, which are not incendiary devices, has been circulating on Colombian and international media networks and on social media. Some trying to illegally enter Venezuela have dressed in Red Cross jackets despite not having permission to. Also Saturday morning another false flag operation was denounced by the Venezuelan government. A group of low-level soldiers of the Venezuelan National Guard Saturday took over multiple armored vehicles that belong to the Venezuelan army and rammed them into border barriers at the Venezuelan-Colombian border in a staged operation ordered by right-wing opposition members in Colombia. During a massive demonstration in favor of peace and democracy in Venezuela, President Nicolas Maduro declared the coup d’etat defeated because of the unity of civil society with the military.